No matter what type of training you are required to produce, Managing the Training Function for Bottom–Line Results will help you assess, clarify, and develop ten key activities of the training function. 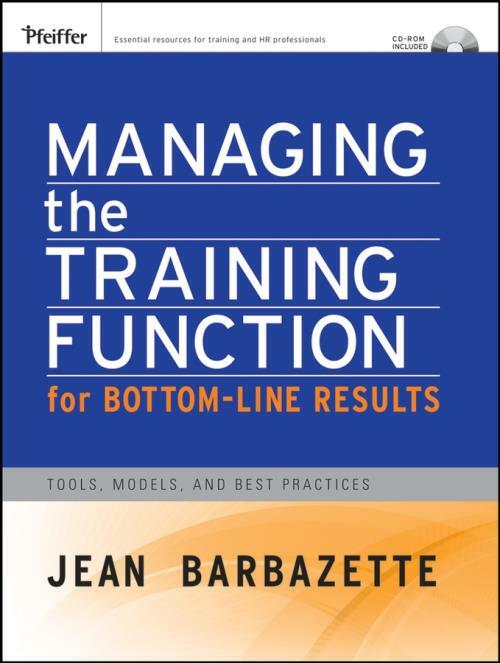 Written by Jean Barbazette an expert in the field of training and development this book is filled with best practices, illustrative success stories, and practical ideas for moving the training function to the next level. No matter how large or small your training department may be, this important resource gathers in one place all the tools you need for effectively managing the function including?staff management, setting the learning agenda, hiring consultants and vendors, managing content, creating and managing a learning resource center, building internal?support for training, integrating learning into the business, and much more. The book also provides a unique opportunity to learn from organizations such as Maryland Transit Association, Baxter BioScience, the Utah National Guard, and University of Toyota. "If you want to improve the value of your training department and improve the capabilities of your organization,?start with this excellent book." "Managing the Training Function helps identify the desired versus existing training practices and also how to prioritize the list and work on factors critical to business first and then the least important factors." "I would like to recommend this book to everyone managing a training function, even if your training department has only a single person in charge, it will be of great help to you and your organization."